I saw an advert. for a crash-bar (out of Thailand) selling for around $169. Looks like the SW-Motech one w/ added protection. Can't find the ad. right now. "New Kawasaki R9 Versys 650 07-14 Motorcycle Bike Engine Guard Crash Bar Steel"
They were $135 on Ebay. Other than the crummy packing job which left them slightly scratched, I can't complain. They look pretty good. Hoping I don't need to test them, but if I do, I really hope they work. Despite riding a fair amount of dirt, now-and-then, I lowsided on my '08 at about 20 mph riding pavement, thru a hairpin, when my line put the front wheel onto the yellow line which was PLASTIC, not painted. INSTANT down...! My crash bars and handguards did a VG job protecting the bike from damage, except that my shift-lever got bent. Sorry for the delayed response. Not the best pic, but you can see them OK in this one. The bump out provides a nice place to rest your leg for a stretch on a long ride. Can I get some more info on the pro moto upper crash bars from on page 2? on the white versys? 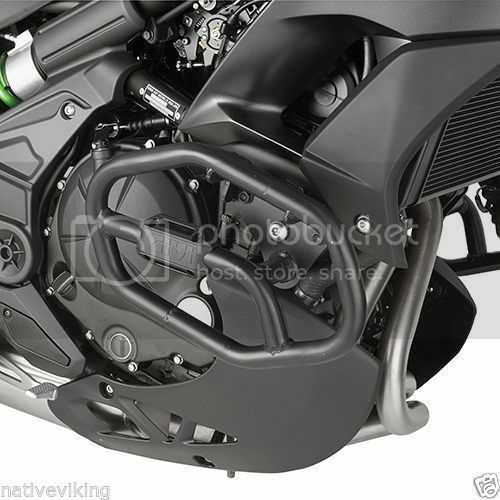 I too am looking at crash bars for my 2015 v 650 and really appreciate the photos 3dog. As part of my search, I've compiled a list of url's for the 4 crash bars that fit the 2015 v's. http://www.amazon.com/T-Rex-Racing-K...dp/B016E4Y8TE/ Nice kit for bike protection but not available yet for 2015+ v's. They say they are working on it. Feel free to add links if you find other crash bars. Personally I like the SW-motech for its nice style, easy installation, and less interference with access for maintenance. But it looks like it offers less protection than the Dimotiv. I've just installed the RDMoto crash bars on my '15 V650. They protect the lower engine quite well, which none of the other brands do. The RDMoto kit is pretty good. They provide replacement bolts and nuts except for one nut which they want you to reuse the original. But the threads are different and I had to run to Home Depot and buy a nut. It could be Kawasaki uses different hardware at different times or for different markets, so I don't blame RDMoto for the mismatch. The bars seem sturdy. The paint is well done. Workmanship seems fine. The lower right side bar was just a fraction of an inch off and I couldn't get the bolt through where it attaches to the motor mount down by the rider's right foot. A few minutes with a metal blade in a saber saw and the hole was easily enlarged. Again, this could be an issue with Kawasaki's manufacturing tolerances and not RDMoto's fault. Overall I'm happy with these bars. Do you have any pictures of your finished install? I do. Is there anything in particular you'd like pictures of? The smudges on the bars are dirt from my feet, not blemishes in the finish. The instructions are a bit cryptic but actually do include all the info you need except for torque values. The engine mount bolts are 32 ft-lbs. The right footpeg mounting plate is 18 ft-lbs. There are a couple of fairing attach bolts which are snug but not cranked down. I don't recall a torque for those. Do follow the order of assembly implied by the instructions, start with the left side then finish with the right. I recommend dry fitting everything first, then going back and using Loc-Tite and torquing everything down. Just in case something doesn't fit quite right or needs some jiggling to get into place. Here are the bars as installed. You can see the bars don't come up as high as the advertising photos trick the eye into thinking they do. They are as the marketing photos show, but I was thinking they would look higher up than they really are. The lower left bar nicely protects the engine. The bolt it attaches to is the lower engine mount. The kit comes with a new threaded rod and one Ny-Lock nut. You're supposed to re-use the original lock-nut on the other side but the threading was different so I bought a replacement at Home Depot for 50 cents. The lower right side requires the foot peg plate be removed. No big deal. Do this as you're installing the left side because you can't remove the lower engine mount bolt with the plate installed. Attaching the foot peg plate is the last item on final re-assembly. Here's the bolt hole I had to enlarge on the lower right mounting plate which attaches under the right foot peg. It just needed a tiny bit more room. The original slot was about 1/4" x 1/2". The one frustration was fitting locknuts to the upper engine mount bolts. RDMoto supplied Ny-Lock nuts but they didn't fit in the cast slots in the engine casing. This photo is looking from the front. It is under the radiator and on the front of the cylinder casing. The bolt is sticking through but the nut is not yet installed. The recess where the nut sits is visible. The second picture is the other side so it appears reversed left/right from the first picture. This is the nut installed in the recess. The Ny-Lock is too tall to fit, so I had to grind the top of the nut a little bit. No big deal with a grinding wheel. Alternatively, use a hand file or buy another style of lock nut. I used Loc-Tite on these nuts also. Thanks, you covered everything I was curious about. Marketing photos vs. real world and all of the attachment points. Looks like you did a good job improvising with what was provided. I jut bought and installed the T-Rex engine guards with Side picks and small engine kid type plate. The fit and finish is very good, and they seem to be quite stout. very impressed with what I received for what I paid. 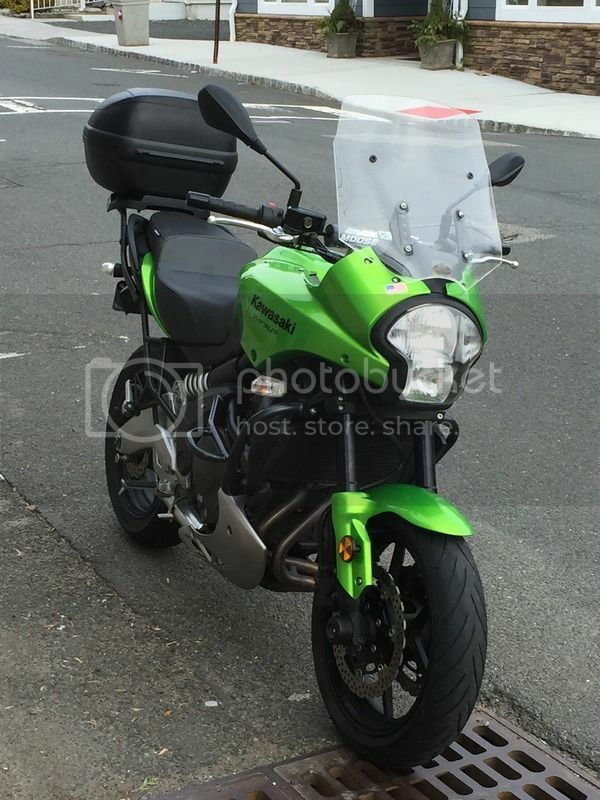 Way better than Givi and the same price. I'm really impressed with my T-Rex stands. Way less $ than Pit Bull, maybe not as nice, but I'm not trying to show off at the track either. Can't wait to see what T-Rex does for the 2015 Crash Bars. Today I became a believer in the RDMoto crash bars for the 2015. The cage around the lower engine was put to good use. At the end of a long day of back country riding, I was tired and somehow got a bit sideways in a water crossing. We'd been back and forth across it 6 times during the day, but this time it didn't go so well! The bike ended up pretty much right where I was standing taking this picture of another rider in the group earlier in the day. Anyhow, had I not had the lower protection, the engine would have taken a hit. The shift lever and foot peg probably would have taken more abuse, too. So count this as one vote for crash bars that wrap the lower engine. anyone knows if the motowerks highway pegs can still be fitted with the dimotiv crashbars? it looks like they would, with maybe a spacer on the left side's floating supporting point. Last edited by dddd; 07-25-2016 at 08:05 PM. Looks like what I'm after but isn't listed on the Touratech USA website. Up to 3 month wait as well. I'm hoping they come out soon as well.